Gage: I’d change the first part of the book. Cam: I wouldn’t change anything; it was close to perfect. I liked how the two stories came together at the end. I liked that Rose was related to Ben. The picture of the old woman in Ben’s story was interesting. Harry: I would change the part where Ben’s ear was struck by lightning. Cam: I thought that part was cool…the part where Ben got on the bus to go to NYC was far-fetched. The third part is where you put clues together. The other two parts put the mysteries together. Did you like how the story was part in words and part in pictures? Wonderstruck is cool how there is a whole story told in pictures. Cam: Jamie. He was kind of stupid. He took too many photos. Harry: I liked Jamie but not exactly. Gage: I would be Ben because he was the main character. Harry: Rose isn’t as important. Cam: Rose is the most important because the rest of the story wouldn’t have happened without her. Cam: I wouldn’t want to be Ben’s mom since she got in a car accident. Harry: The drawings were awesome. They are very realistic. Cam: The thicker the book, the cooler the drawings. Were you confused by who Walter was? Cam: I had bad visions of a guy named Francesco with a huge mustache who went by the name Walter as well. Harry: Walter was scary when you didn’t know that it was Rose’s brother. Cam: The mom. She knows that her son will be happy so that will make her happy. She’d be happy that he has family again. Harry: I want Ben to live happy forever. Rose has already been happy. Cam: 4 ¾ because I didn’t like Jamie always taking photos. He’s one dimensional. Harry: It would be a museum of the most amazing scientific things in the world. Dinosaurs, aliens. I would put my museum on Mars. One half in NYC and one in Mars. A spaceship train would go from NYC to Mars. It would exist in 3010 and you’d have to take a time-warp to go visit it. Cam: I would have a sports museum. I would have the uniforms of the most legendary players (Jackie Robinson, Babe Ruth). In each section, there would be one thing that didn’t belong (a lacrosse stick in the hockey section). My museum would be in New Jersey. When I visit my aunt and uncle in NJ, we keep going to the same places. I want someplace new to visit; my own museum. So, the response to Selznick's latest was overall positive. Andreas thought that the pictures were amazing and that the New York City locale was awesome. On a scale of 1-10, he rated the book a 9.9! 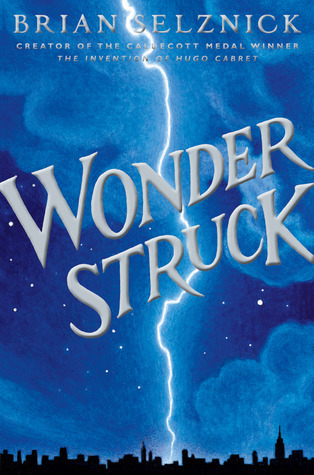 All the boys are excited to see Wonderstruck turned into a movie, much like his book The Invention of Hugo Cabret. In July, we will be reading The Search for WondLa by Tony DiTerlizzi. In August, we’ll read The MysteriousBenedict Society by Trenton Lee Stewart.